Loud Lion (Or is it LoudLion? I’ve seen it spelled both ways by the band and the record label…) is a project put together by indie rock/pop musician & producer Bleu along with some help from members of the Donnas, Rooney and Bang Camaro and a few others. Their goal? To emulate Def Leppard and the “Mutt Lange sound” just as good and as better as any band before them. Loud Lion… Def Leppard… get it? Bleu has another project that plays music in a style similar to Electric Light Orchestra (E.L.O.) called L.E.O. The band was first put together over 7 years ago. The handful of songs out there before the release of Die Tough were available on the band’s MySpace band years ago along with some appearances on a few movie soundtracks such as The Hills Have Eyes 2 and Balls of Fury. 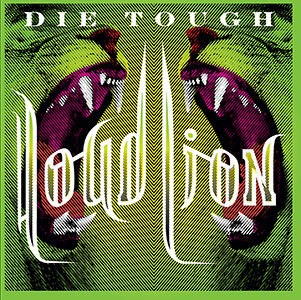 Loud Lion even covered Def Leppard’s “Rock of Ages” on the Balls of Fury soundtrack. To my knowledge, “Lion’s Den”, “Lion Eyes”, “Sunset Slip” and “None More Fast” have never been released until now. I’m not sure if they are recent songs or if they came from the same sessions years back that produced much of the rest of the album. As far as I can tell, the rest of the tracks are the very same ones that were released years ago. I know a Loud Lion album was supposed to happen a very long time ago. Not sure what happened there because it’s been about 7 years since Loud Lion first released some music. Even now in the wake of this album’s release the band’s Facebook & Twitter pages haven’t been updated since 2011. I still love the previously released material the best but “Lion’s Den” and “Sunset Slip” are cool tracks. As Def Leppard is sometimes more prone to sounding like a ’70s glam rock band these days (C’mon, Joe, that’s what the Down ‘N’ Outz are for! ), I am always in a welcoming mood for any group that wants to emulate what Def Leppard did with Mutt Lange in the 1980s. Similar to the KISS-like 1977, many of these tracks are meant to slightly remind you of a few Def Leppard classics. There’s enough of a difference to keep things interesting and for the songs to have their own identity while still invoking those familiar vibes and warm fuzzy feelings that you might get from listening to Def Leppard’s “Rocket” or “Love Bites”. While much of the material isn’t exactly recent, it’s still great to finally see Loud Lion get an album release. Hopefully people take notice and Bleu will give us some new Loud Lion songs in the future. This is a must have release for fans of Def Leppard. It’s the greatest album Def Leppard never recorded!